Lush Fab Glam Inspired Lifestyle For The Modern Woman: Dare to Wear: 1980's Fashion Makes a Come Back at Milan Fashion Week﻿! Dare to Wear: 1980's Fashion Makes a Come Back at Milan Fashion Week﻿! Blumarine gave us a big taste of the 80's during their Fall 2012 Ready-To-Wear runway show at Milan Fashion Week. The neon bright colors, shiny metallic fabrics, kaleidoscope boots and head to toe leopard prints was a jaw dropping fashion blast from the past recycling its way into current fashion. 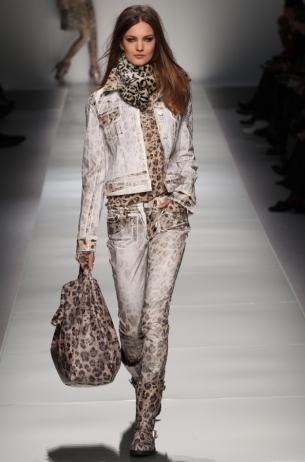 See more runway styles from Milan and New York Fashion Week Fall 2012 RTW collections. What do you think of Blumarine's Fall 2012 Collection and which designs would you dare to wear? Leave a comment below. It's like a Madonna meets whitney meets Kylie Minogue video from the 80's.